View from SW with water wheel under extension on left side. Digital image of C 3909 CN. 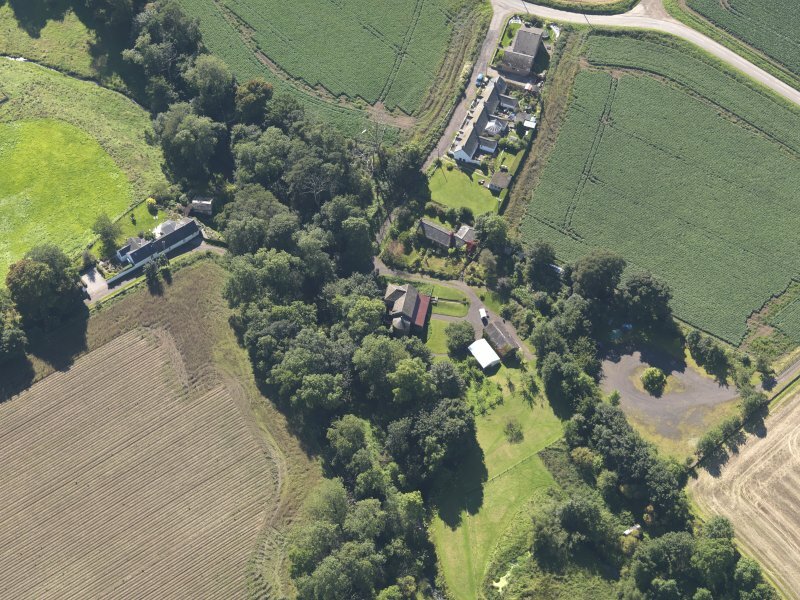 General oblique aerial view of Woodside Cottages, centred on the mill, taken from the SW.
View from West. Digital image of C 3912 CN. 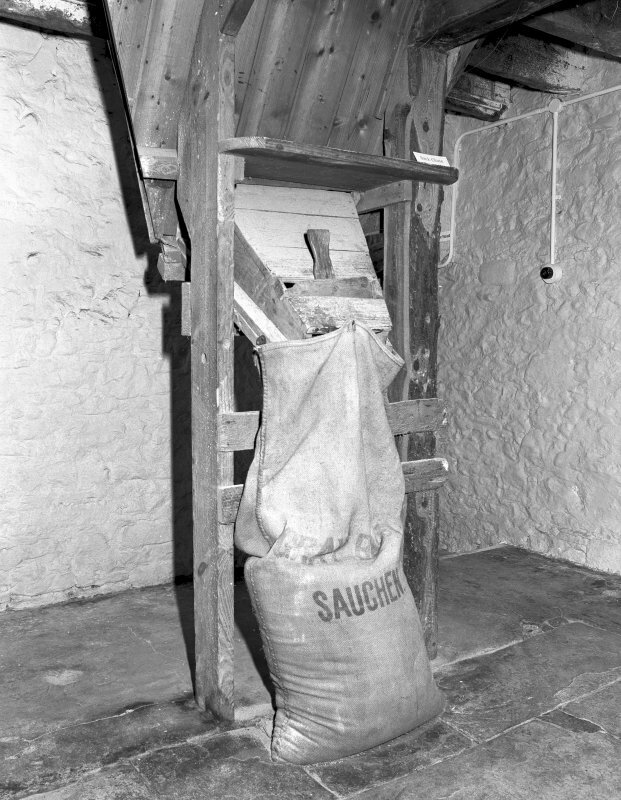 Detail of sack filler for dried grain after it is removed from the kiln floor, located at ground floor level. Digital image of C 3933. 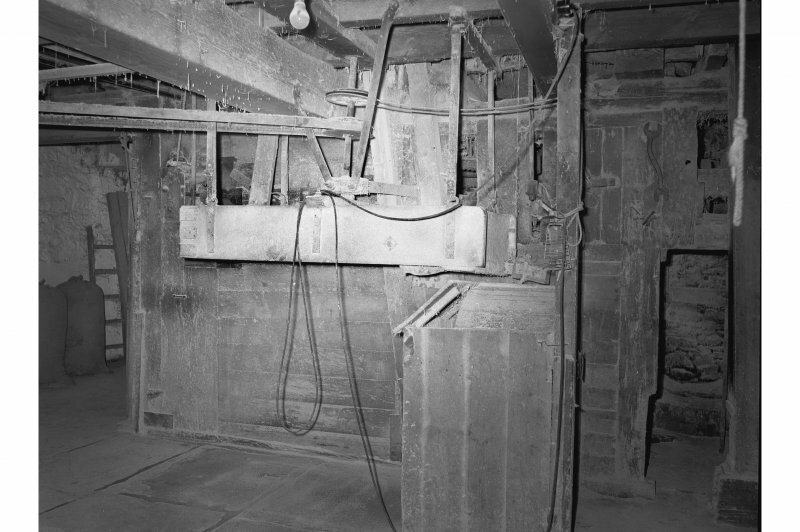 Interior view from East of millstones on first floor. Digital image of C 3920 CN. Detail of kiln firebox. Digital image of C 3934. 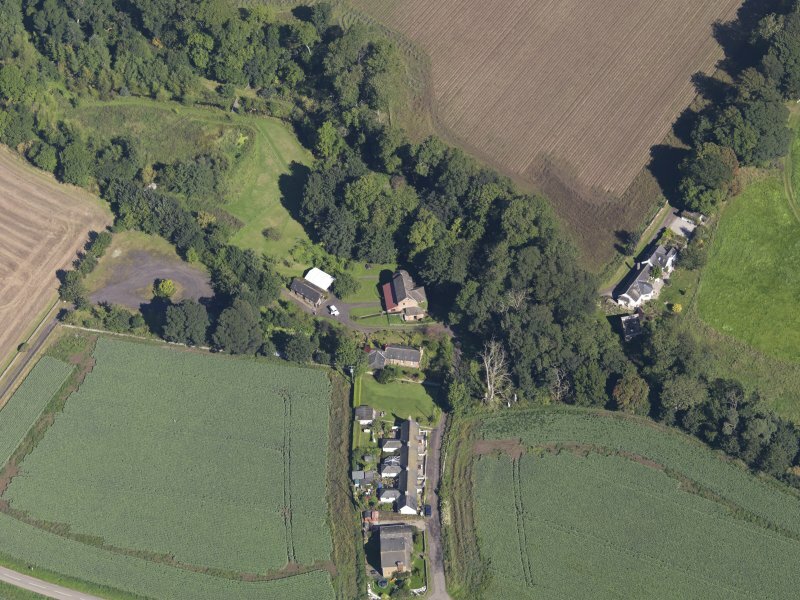 General oblique aerial view of Woodside Cottages, centred on the mill, taken from the NW. 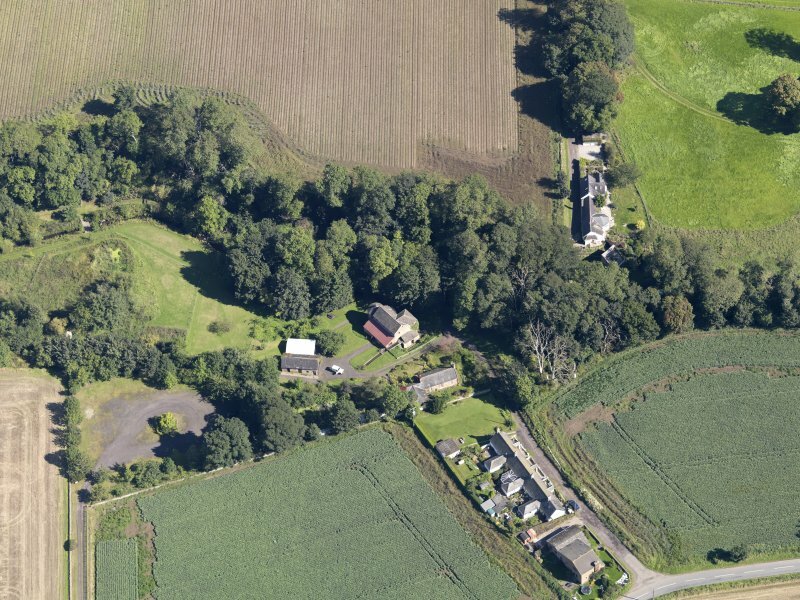 General oblique aerial view of Woodside Cottages, centred on the mill taken from the SE. 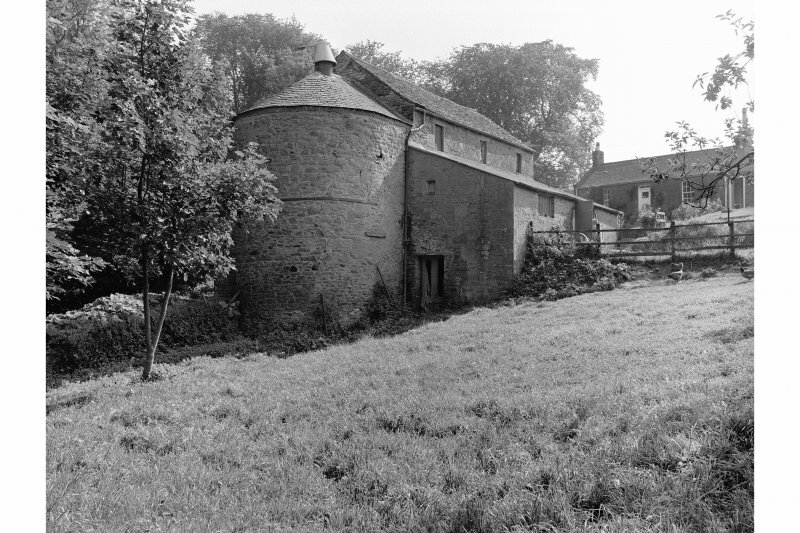 View from South showing water wheel cover and lade by-pass. Digital image of C 3910. Detail of Insurance Company Plaque on door. Digital image of C 3938. 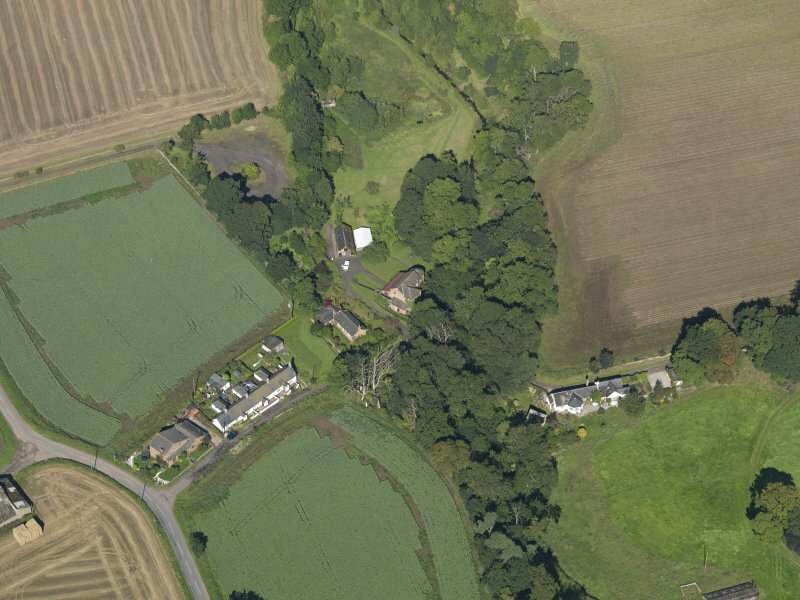 General oblique aerial view of Woodside Cottages, centred on the mill, taken from the SSW. For Barry, Lower Mill (NO 5365 3452), see NO53SW 23. (Location cited as NO 534 349). Upper Mill, Barry, rebuilt late 19th century. 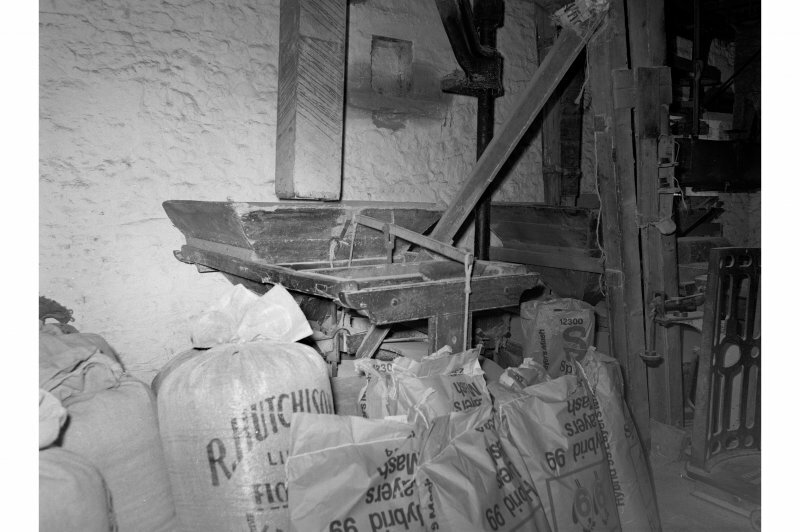 A two-storey, attic and basement sandstone-rubble building, roofed with local slates. 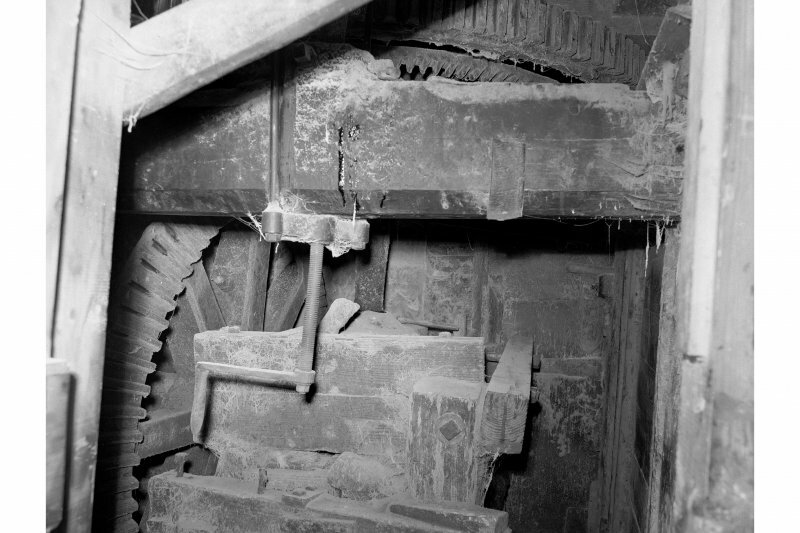 There is a circular kiln with conical roof. The two pairs of stones are 52ins (1.32m) dimaeter and are driven by a ten-spoke overshot wood and iron wheel with cross bracing, 38ins (0.96m) wide by 15ft 6ins (4.77m) diameter in a lean-to wheelhouse. Still making oatmeal. 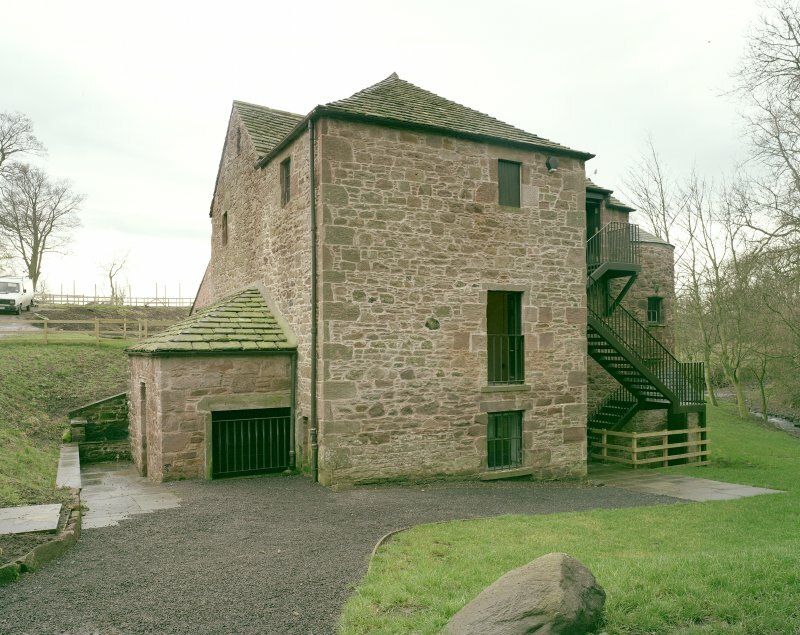 Barry Mill is a three-storey sandstone rubble building consisting of basement (meal floor), ground floor (milling or stone floor) and attic (hopper or bin floor), and with an Angus stone slate roof. The basic plan is L-shaped with a circular kiln to the north, enclosed water-wheel to the south and a single-storey lean to extension to the west. The present building dates to 1814, after the previous iteration was destroyed by a fire. 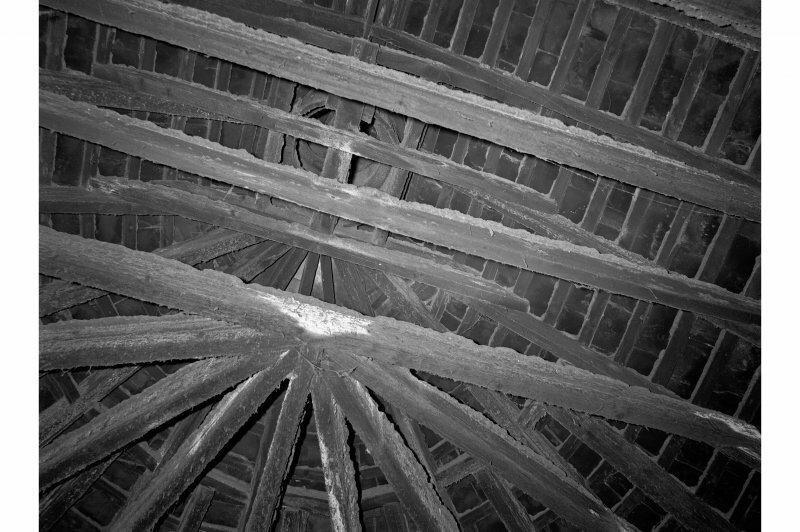 The circular kiln 4.4m in diameter represents a development in design from the separate kiln (such as at Preston Mill, East Lothian). 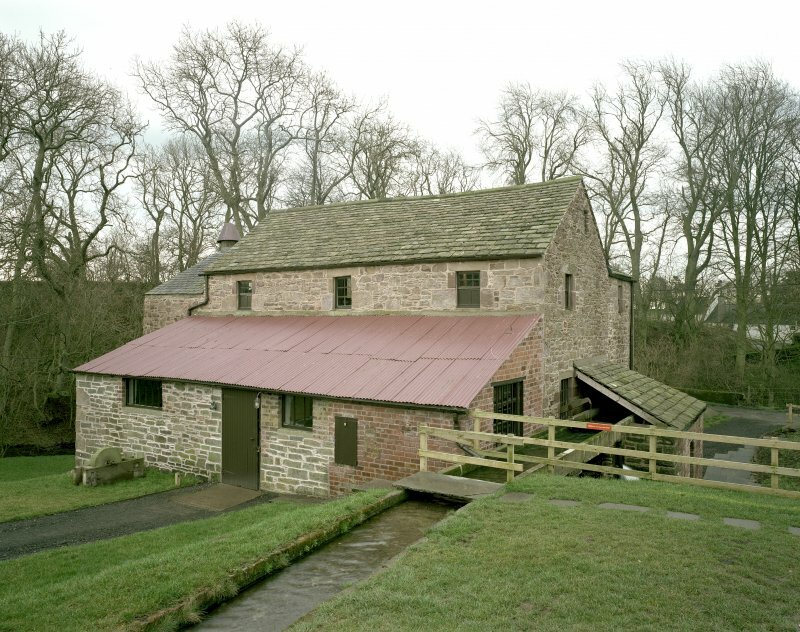 It originally stood to the same height as the mill but was lowered in 1940 giving the roofline a stepped profile. 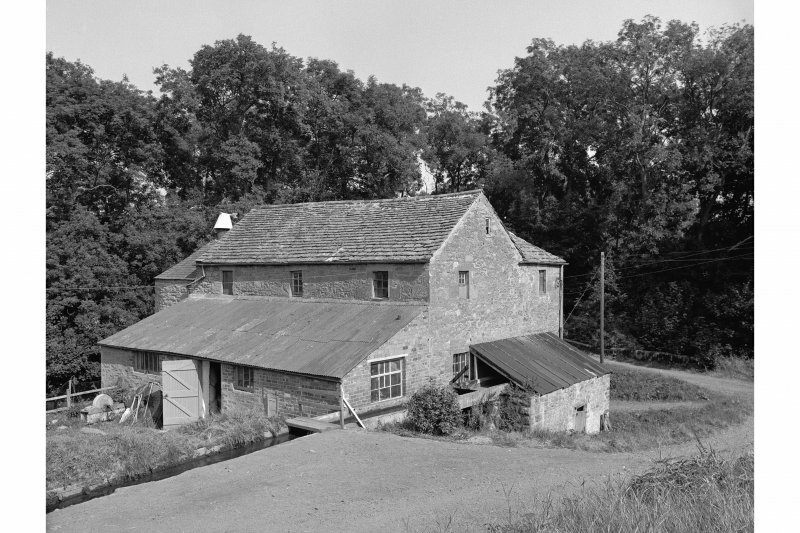 The original stone-built, lean-to annexe built to the rear of the mill was extended around 1930 in order to accommodate more grain. 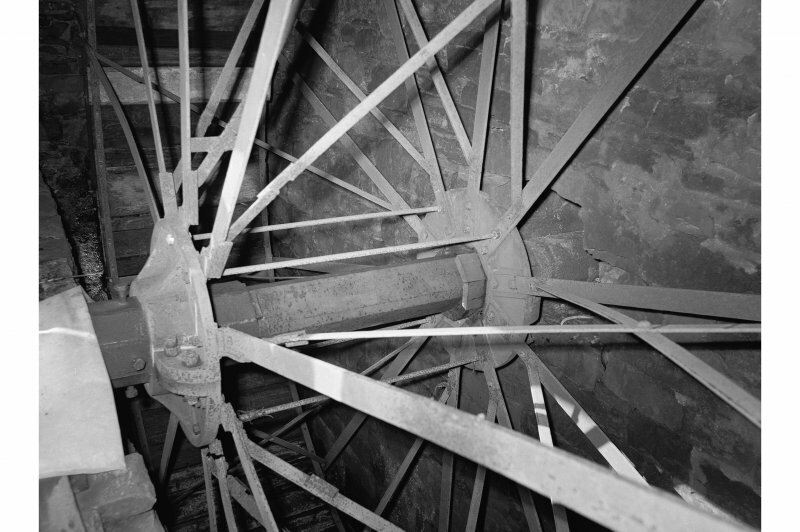 The overshoot wheel is 4.7m in diameter and built of iron & wood. It consists of 30 wooden buckets each 0.92m wide. Its lightweight construction suggests a fairly modern date but it uses the original axle. It is enclosed within a lean-to wheel-house. 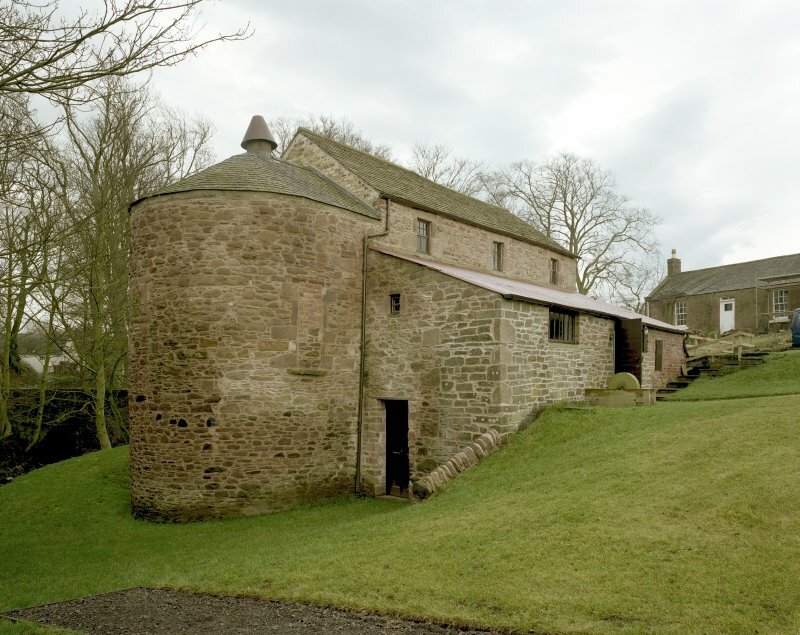 A conservation programme was initiated in the late 1980s which included restoring stonework, replacing the kiln floor and wheel housing, and re-roofing with Angus stone slate. 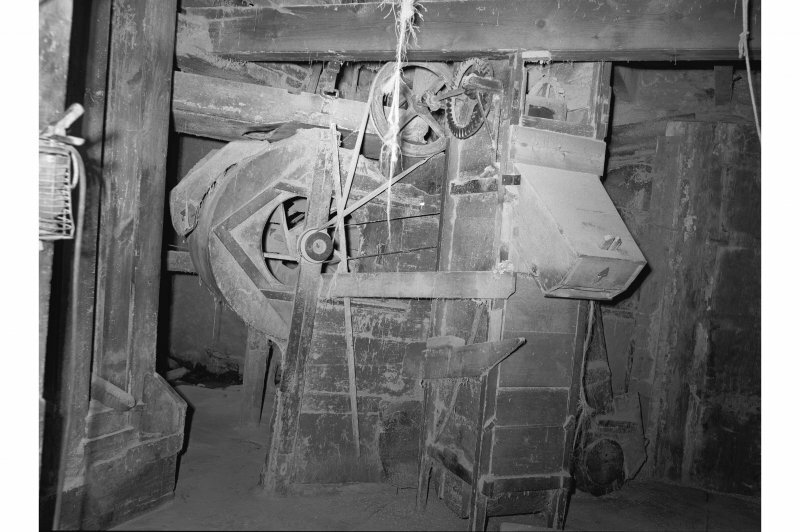 The machinery inside the mill was also completely restored. 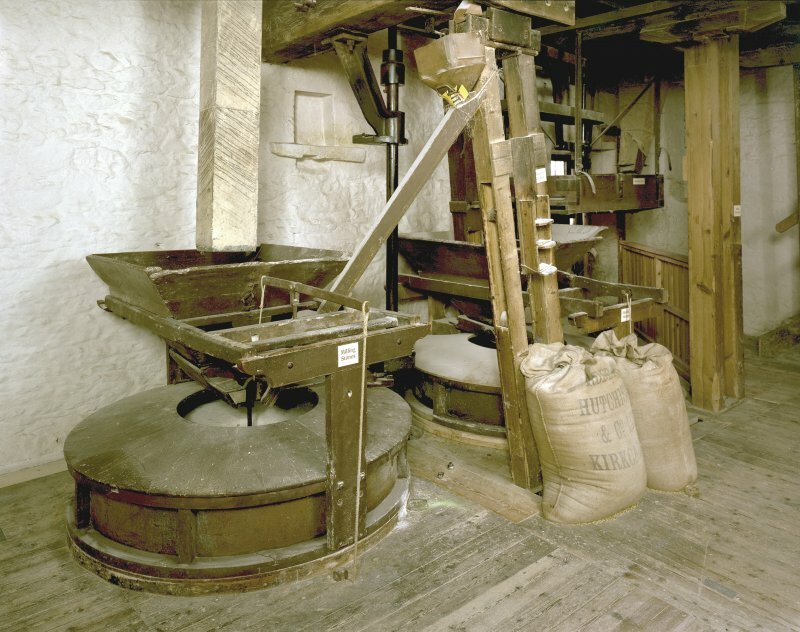 This well-conserved fully working water-powered oatmeal mill dates from the 18th century, rebuilt in 1814, re-equipped in the late 19th century. 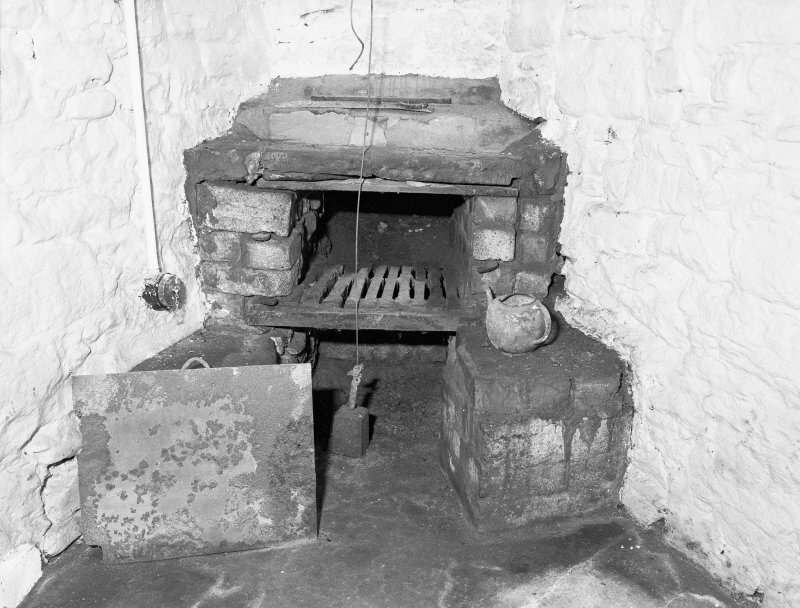 The semicircular kiln is a distinctive Angus feature. The wheel is 4.6m diameter and 0.96m across, crossbraced with ten spokes per side. 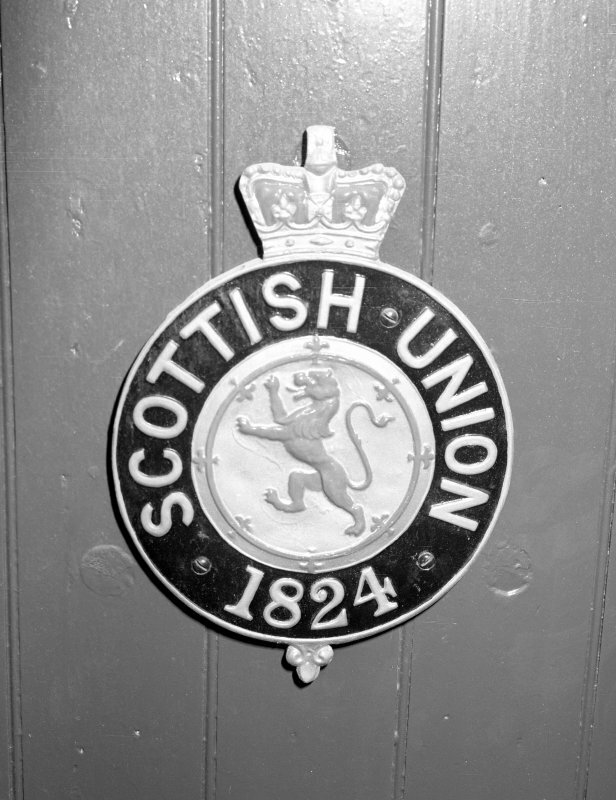 It worked commercially until 1982, was bought in 1988, repaired and operated by The National Trust for Scotland since 1992. 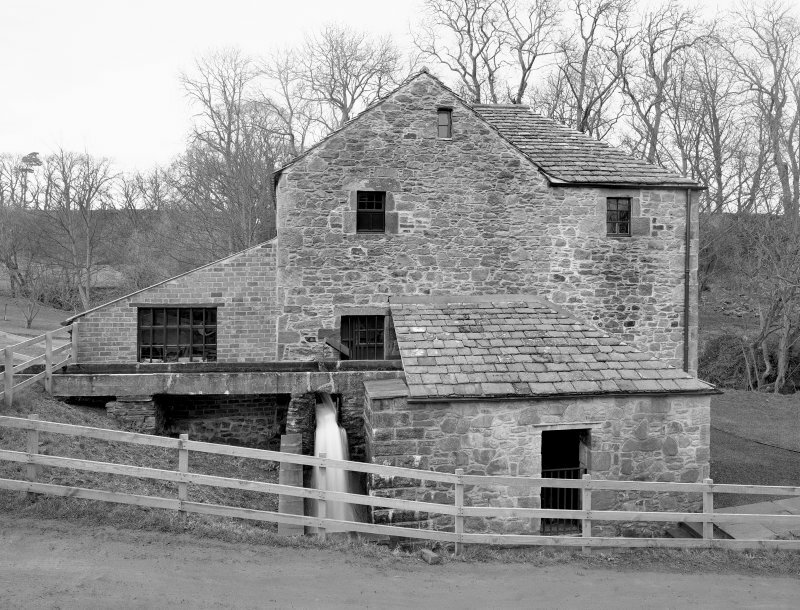 There are milling demonstrations and a walkway leads along the lade to the mill pond. The old Dundee-Arbroath road passes over a stone arched bridge, bypassed by the turnpike.